Everyone has a few bad habits, and that’s perfectly OK because we’re all human! However, some tend to be worse than others, especially those that can do daily damage to your teeth. Many people do things that negatively impact their oral health every day and don’t even notice. What are they? Today, your dentist reveals 4 common habits you should avoid in order to keep your smile looking and feeling its best. Most people enjoy an ice cold soda at lunch or an energy drink in the afternoon, and it’s not news that these drinks are simply packed to the brim with sugar that can damage your teeth and make you more likely to develop cavities. While drinking things like soft drinks, juices, and energy drinks are sort of alright during meals, it’s a problem if they become your default drink whenever you are thirsty. Constantly sipping on sweet drinks exposes your teeth to sugar for extended periods of time, which can make them extremely vulnerable. The alternative? Whenever you’re thirsty, always quench yourself with water, and save the sweet treats for only specific occasions. It’s common for people to have something to always munch on within arm’s reach whenever they are at work or at home. Snacking can be a good or bad thing for your teeth all depending on what you choose to indulge in. Items like candies, crackers, and chips can stick to the teeth and cover them in sugar every time you take a bite, and they can be especially troublesome if you graze on them throughout the day. 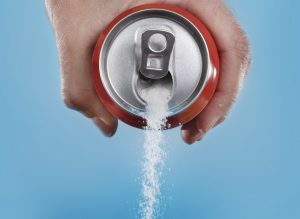 Much like with sugary drinks, this constantly exposes your teeth to sugar, which can significantly weaken them over time. If you get hungry between meals, reach for something like apples, carrots, or celery. They are low in sugar, and their fibrous texture will help stimulate saliva production in your mouth, giving it a nice internal rinse. Chewing on ice gives people a very satisfying crunch after finishing a drink, but we can’t stress enough just how bad this is for your teeth! Biting down onto something this hard can easily break one of your teeth, which is not only painful in itself, but can also make your tooth much more likely to develop an infection that will require a root canal to fix. Most people chew ice without even thinking about it, so just keep this in mind the next time you have a frosty beverage. Did you know that about 40% of all sports injuries are actually dental injuries, and that is true even for non-contact sports? When people are running around and throwing things at full speed, it’s all too often that something (or someone) collides with the teeth. If they are completely unprotected, they are likely to chip, break, and even be knocked out. A mouthguard helps shield your smile from these unforeseen accidents, and you can often get a completely custom-made one from your dentist that will fit much better than anything you can get from the store. With it, you can go into any game with one less thing to worry about. Do any of these habits sound familiar? If so, you may be putting your smile in danger and not even know it. Avoiding these habits will help your teeth stay much healthier over the years, which will not only make it easier to smile, but it will also save you countless dollars on avoidable dental care. Fortunately, all of these habits are easy to break, and trust us when we say your teeth will thank you for it! Dr. Masha Kogan is a general, restorative, and cosmetic dentist based in Westport, CT. She loves giving simple tips that can help people take care of their teeth every day, and she always has more to offer! To learn more about everything you’ve just read, she can be contacted through her website.